Why Is February 14 Such a Busy Day in the Lulu? 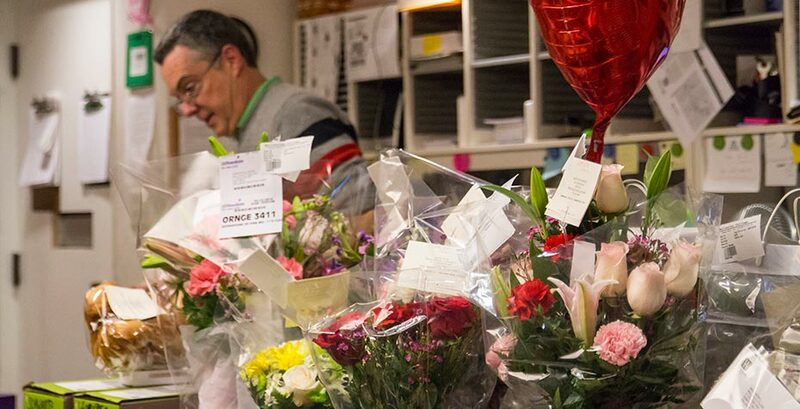 For many people, Valentine’s Day is the time to exchange flowers and cards with loved ones; for those in mail services at Wellesley, it is one of the busiest times of the year. According to Fran Adams, manager of Wellesley’s postal services, in February 2013 student mail services received 12,620 pieces of letter mail and 9,351 packages. For context: The student mail center received 191,087 letters and 54,747 packages over the entire year. This February promises a similar influx. Letters and tokens to and from Wellesley women keep the post office busy. Meanwhile, historic letters of Wellesley women and others keep experts in Archives and Special Collections busy too, and unlike current mail, they can be viewed and read upon request. The most famous (and Valentine-y) of the College’s collection are the Browning love letters, now digitized. Victorian poets Elizabeth Barrett Browning and Robert Browning carried on a secret affair in letters and meetings before eloping to Italy to escape Elizabeth’s tyrannical father. In Sonnets from the Portuguese, Elizabeth wrote about the experience of receiving one of Robert’s notes. Wishing everyone nothing but good news in the mail, whether archive-worthy or not. And thanks to Wellesley’s mail services staff for all their hard work.